Making something already fast go faster is, of course, fun, but it's not nearly as impressive as making something really slow go fast. Which is why I'm so taken with this bonkers 220 HP V-twin riding mower from the mower-racing loons at Midwest Supercub. 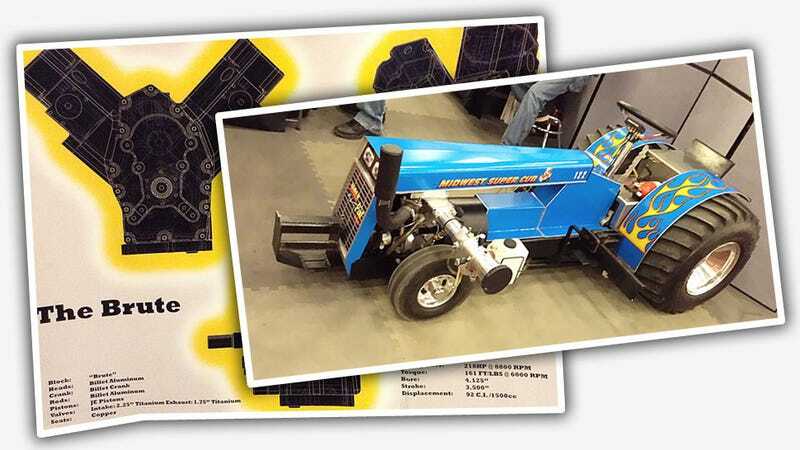 Shown in a little room for latecomers at the Performance Driving Industry show in Indianapolis last week, the mower was a showcase for Midwest Supercub's Kohler Courage V-twin based motor, called the Brute. That original engine makes about 27 HP stock, which should make the alcohol-fueled monstrosity that Midwest Supercub built even more impressive. That V-twin puts its power out through a custom transmission (no word on if the cutting blade is retained) and goes to the wheels via a Dodge Dart rear axle, of all things. The important take away here is that there are people building some really insanely fast mowers out there, and they deserve our support, as a nation.